Bryan Unruh at West Florida Research and Education Center in Jay, Florida. In high school, Unruh envisioned himself as a corporate attorney. But when advisors from Kansas State University showed up in his hometown, he declared himself a horticulture major. “I couldn’t fathom going to school for seven-plus years and then sitting behind a desk,” said Unruh, a professor of environmental horticulture at the University of Florida Institute of Food and Agricultural Sciences. Ironically, he spent 10-plus years earning his three college degrees. Unruh has spent the last 23 years at UF/IFAS, helping people grow beautiful grass in environmentally friendly ways. Unruh is now being recognized for his outreach and Extension efforts. He will be honored with the Turfgrass Educator Award of Excellence at the International Education Conference of Turfgrass Producers International on Feb. 19, in Charlotte, North Carolina. Previous recipients of this award include fellow UF/IFAS Professor Laurie Trenholm (2008), Ali Harivandi of the University of California Cooperative Extension Service (2014) and Grady Miller of North Carolina State University (2016). The award recognizes Unruh’s commitment, dedication and positive influence in helping to educate consumers, turfgrass producers and industry professionals, said Karen Cooper, associate executive director of Turfgrass Producers International. It’s also a way to honor Unruh for making himself available to address turfgrass questions and concerns that promote the use and benefits of turfgrass. 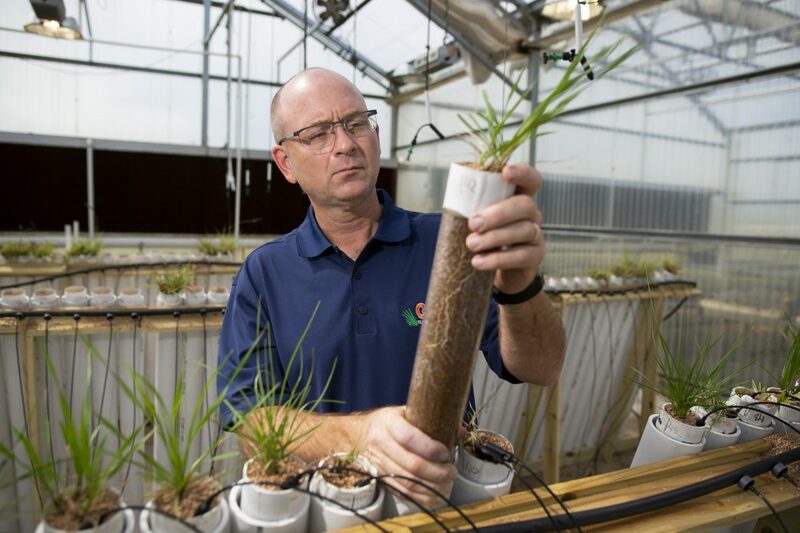 “It’s quite humbling when you are asked if you can be nominated for such an award – it takes it to a whole new level when you are named the recipient,” said Unruh, a faculty member at the UF/IFAS West Florida Research and Education Center in Jay, Florida. Unruh, who specializes in turfgrass research and Extension, finds it rewarding to help people resolve a problem, improve their management practices or help them through difficult and trying times. The Turfgrass Prorducers of Florida nominated Unruh for the award and used letters from three other organizations to support the nomination: the Florida Golf Course Superintendents Association, the Seven Rivers Golf Course Superintendents Association and the Florida Turfgrass Association. Betsy McGill, executive director of the Turfgrass Producers of Florida, sang Unruh’s praises in her letter supporting him for the award.